Edith Wharton had a vivid imagination. As a child, she loved to play a game she called “Making up” which involved inventing stories as, book in hand, she walked around feverishly chanting as if in a trance. This caused her parents much consternation. When friends came to play, she asked her mother to entertain them as she was “too busy making up”. Her mother, obviously worried about the affect of fiction on the impressionable girl, forbade her from reading novels until she married. She agreed to this. It must have been interminable for her, because she married at the ripe old age of 23, which, in those days, precariously bordered on being an old maid. Although she wrote 40 books in 40 years time, she did not write a novel until she was actually in her 40’s. There is a saying: “Keeping up with the Joneses”. The family being alluded to was Edith Jones Wharton’s. Her parents, George Frederik and Lucretia Rhinelander Jones were from “Old Money”. This wealth afforded Edith a first class education composed of extensive travel, a talented governess and the books in her father’s library. 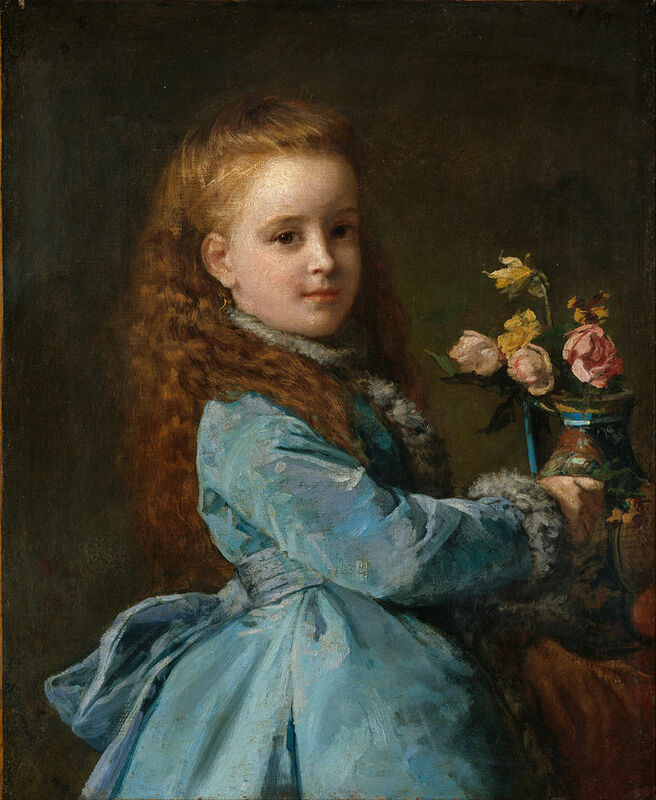 As with all upper class girls of the time, Edith was expected to marry well and toward that end, she “came out” into New York Society at age 17. 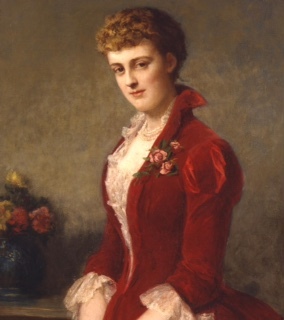 She married Edward Wharton in 1885 and became part of Newport Society for the next sixteen years. 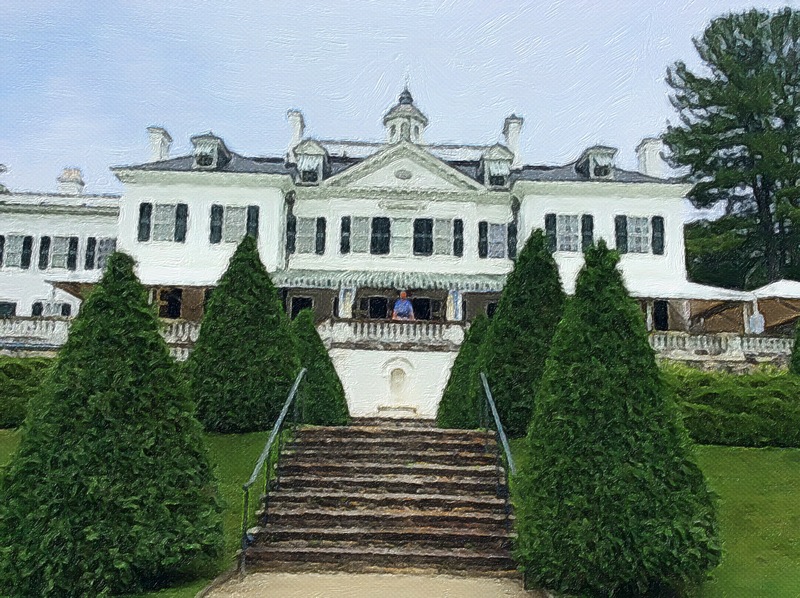 To escape the oppressiveness of Newport social life, she bought land in the Berkshires on which to build The Mount, a home she personally designed. It was here that she honed her skills as a designer, a gardener and writer. They lived at The Mount only for ten years, but it was in this magnificent environment that she created her greatest works. During this time, her marriage to Teddy disintegrated. After eleven years, she sold The Mount, moved to France, and eventually divorced him. Her first published work was a collaboration with architect, Ogden Codman entitled The Decoration of Houses. When she began to write her novels, her talent for describing detail made them coveted editions. She was the first woman to receive the Pulitzer Prize for her novel, The Age of Innocence. Within her books can be seen a reflection of the people and times of the era, partiularly the elite and the world in which they inhabited. She could be quite judgmental on the manner in which they lived their entitled lives. It was, perhaps, best for her that she chose to settle in France away from the New York and Newport Society dams of the day. During World War I, she remained in Paris to support the French war effort with her humanitarian projects. She dedicated herself to aiding those suffering most from the war, establishing sanctuaries for refuges, schools for children, and homes for people diagnosed with tuberculosis. She was nominated for the Nobel Prize for Literature three times. She was one of only a small number of journalists allowed on the front lines and in 1916 she received The French Legion of Honor for her work during the war. Wharton’s loves included literature, architecture and travel and she developed a strong kinship for France and Italy. While at The Mount this July, I took some photos of the French and Italian Gardens. Edith’s beloved home has been restored over the years and is now a reminder of that long ago time and a center for the arts. There are performances of plays and music and lectures and during the summer, children can listen to stories being told in the Italian Garden thanks to Books and Blooms. I was invited by Kelly Bevan Mcllquham, editor of Berkshire Family Focus, to read the January story from my book, A Berkshire Tale. Because of an early morning rain shower, we decided to have our reading on the porch overlooking the gardens. Little visitors came in and out with parents to hear the story, chat with me and to do a craft which involved making an invitation for a person (or a pet, in some cases) to read with them. There were also pages of kittens and alpacas to color and decorate thanks to Rebecca McBrien. A family visiting from Paris stopped by to join in the fun and brought a book back home with them to France to share with cousins. I think Edith would have liked that. Thanks, Kate. Lots to write about, so the post was a bit abridged. But there are tons of books about her. Great post Claremary. We’ve hear the expression countless times but never knew its history. We just know we have tried through the years to not try and keep up with another’s dream but rather do what you are doing so wonderfully and that is pursuing your dream. Yes, I heard the saying during my childhood and just thought it was referring to wanting what your neighber had – the grass is greener. Of course, I never had rich neighbors like Edith’s family. It’s true, money has never been important to me and this whole book “thing” is a blast! Thanks for stopping by during your travels. The journey of your own dreams! We are so excited for you Claremary. Clare, I had no idea that Edith Wharton is your inspiration. What a wonderful bio you’ve written here – she was a formidable person, not surprised you admire her. You had an excellent day at the Mount and it looks like everyone else did as well. I love success stories like this. Sharon, I hope you have had some smiles today. Edith was different and had much to admire. But she had her faults, too. Like many of her time, she was anti-Semitic. Very strange for such an open-minded woman. Thanks, Claire. Doing a blog post makes me appreciate what it takes to be a journalist. I’m not as disciplined, though, and have been publishing whenever I have a chance. I hope all is well. Your old friend. Kind of magical Claremary. I thoroughly enjoyed reading Mz Wharton’s story. What a lovely place and setting and gardens, and… So glad for you that you had the chance. Thank you. Herb, you never know who jis reading a blog or a Face Book post. I “liked” the Berkshire Family Focus publication on FB and they got in touch with me about Books and Blooms. It’s such a good idea for bringing children to this beautiful home and its gardens. You’d like it because there were lots of butterflies to chase. I like it already Claremary. Thanks so much. This was a delightful read, Clare. Edith Wharton was a writer—and a woman—of extraordinary strength and talent. I was first introduced to her work in an Ethics class in college—not in the English department, but in the Philosophy Department. After that, I devoured her books. This summer, as part of the Seattle Library’s reading challenge, among the many books to read was one written in the year one of my parents was born. I came across Custom of the Country, written in 1913—and a Wharton book I had somehow missed earlier. It was exceptionally good—luminous writing, vivid characters, and a timeless, thought-provoking theme. Your post reminded me that I want to dig around for more Wharton books I may have missed—or reread some of the ones I have. How lovely to have visited her beautiful home! Hello, Donna. Wharton felt she was a better home and garden designer than a writer. But the same keen qualities evident in her descriptions of decorating rooms and gardens served her well with her descriptive writing style. I often taught Ethan Frome to my high school classes and never tired of it. Thank you. What a special place to give a reading. It must be such fun to know your book has been carried across the ocean to France. Hello, Osyth. I must get to your blog to find out where you are in France and how your abode is coming along. You’re designing your own beautiful space like Edith. She loved France, too, just like you, and you both write so beautifully. Fascinating post. I didn’t know anyting of Edith Wharton’s background and personal life. Oh, I hope you do come to Scotland some day and we get the chance to meet. Jo, when will we have our next chat? So much is happening. Another Grand Jury today in DC! Whoa! I didn’t know that much about Wharton before, thank you for the lesson! I’m impressed she was able to keep her creativity and spark, in spite of how much her parents or marriage must have hampered it. C.J. – the Gardens were amazing and volunteer gardeners were sitting on the paths, working in the rain deadheading the spent buds. I wanted to sit down and help. What a marvelous way to spend a morning. But I did have little ones moving in and out for Books and Blooms waiting for me to read with them. I think Wharton was a natural writer because of her over-active imagination and her incredible ability to use her amazing vocabulary in a keenly perceptive way. Once she married, she was free of parental authority and Teddy had no real power to impose himself in her life. This enabled her to read and write to her heart’s content. There’s even a question as to whether the marriage was ever consummated. Now,although she used her time and money to help others less fortunate, she was unfortunately known to be anti-Semitic. I found that so not in keeping with her life. Taking the photos was a pleasure and I think they came nicely after apping them. I may frame some of them. I’ll stop by to visit with you this weekend. Take care. How wonderful! I have never heard of Edith, and she sounds like someone worth hearing about! Glad you visited her home and shared her story with us! I taught Ethan Frome to high schoolers and it continues to be a favorite, although House of Myrth and Age of Innocence are also wonderful. I’m glad you liked the post. I will have to check one of these out! A fascinating post, Clare. I had no idea Edith Wharton came from such a wealthy and privileged background. Your comment gave me an idea for my next blog post when you used the term “privileged”. For women of that time, it was not so great once they reached marriageable age. I think I’ll title it “Just so Much Chattel”. Thanks! Clare, you sure know how to weave a tale! I was enthralled. And the pictures were gorgeous, as ever. I thought your reading on the porch with the children was a stellar idea, too 🙂 Carry on! You know how to tell a story, dear Clare! Thank you Ann. Now I just have to learn how to video my stories and make them into movies like yours! Oh, you will succeed, have no doubts! Exceptional story, Claremary, and stunning pics. How wonderful to finally know who the “Joneses” are that we are all supposed to be keeping with up! Thanks! I had no idea of Edith ‘s upbringing, and all her accomplishments either!! Gorgeous gardens, thanks so much for sharing the views!! How exciting that you are sharing your stories, where she wrote hers!! Hugs to all, and cuddles to Roxie! your posts always have something new to offer- they are like my tour guides to a faraway land! Arti, I must drop by and visit. I’m so glad to see your comment and I hope all is well and you are getting ready for another busy semester. Thank you. I’m going to continue with the last post by talking about the daughters of the rich back in the Gilded Age. A lovely story, Clare. I knew nothing of Edith Mary Wharton, but I’m glad to have met this talented woman via your blog and to see how her inspiration is alive and well in your writing. What an interesting story Clare. I must confess I knew little of Edith Wharton. The photos of her house and garden are magnificent. I wonder what it felt like to wander through? And even on the veranda – did you try to imagine her life there? I feel an historical novel coming on! I’ve been to The Mount on a few occasions for the tours and I find her life fascinating. I’m writing another post about the Gilded Age and the daughters of the rich American tycoons who were bartered off for royal titles. I’m not sure I have a novel in me – just simple little mysteries with some historic info thrown in. That’s where great stories begin Clare! A wonderfully interesting post. Thanks for sharing. I’ve enjoyed the two Wharton books which you mention, and quoted her in my own books. Thank you for the story about Edith Wharton and the lovely photos. It looks like you and the children had an enjoyable afternoon. You’re welcome. It was a fun time for all of us. Taking photos in those beautiful gardens was quite inspiring. I think if I’d lived at the Mount I’d have written 40 books, too. I’ve missed you and have read most of your older posts a few times to get a chuckle. I always wonder what is happening in your “neighborhood”. I haven’t been posting much because I launched a local mystery book in July and am working on getting a children’s verse book published in December. So, all my literary energy is going into these projects. And I’ve been terribly remiss in reading other’s blog posts. I try to catch up, but some bloggers are a bit prolific and I can just about get to their most recent posts. I hope everything is going well and am sorry you missed Hariod. He has not posted much lately either, but I always read his older posts and still do not understand half of what I’ve read. And forget about the comments! Are all his friends swamis and philosophers? We need to have an email chat soon. I’m good about that at least. The Mount sounds like a wonderful place. You sure had a fabulous day. It is lovely and the tour of the building and grounds is very educational. I love learning about the people and places of the past especially when I can actually be in the setting, itself. Thanks, so much for your note. Oh, she definitely would have enjoyed that – and what her home has become! Thank you for the follow and all the likes, Claremary. Lovely to meet you! It’s been a pleasure, Clare.